Valves are moderately dorsiventral with slightly or moderately rostrate, narrowly rounded apices. The dorsal margin is moderately arched. The ventral margin is moderately tumid at the center in larger specimens to convex in smaller specimens. The axial area is narrow. The central area is rounded in larger specimens and indistinct in small specimens. 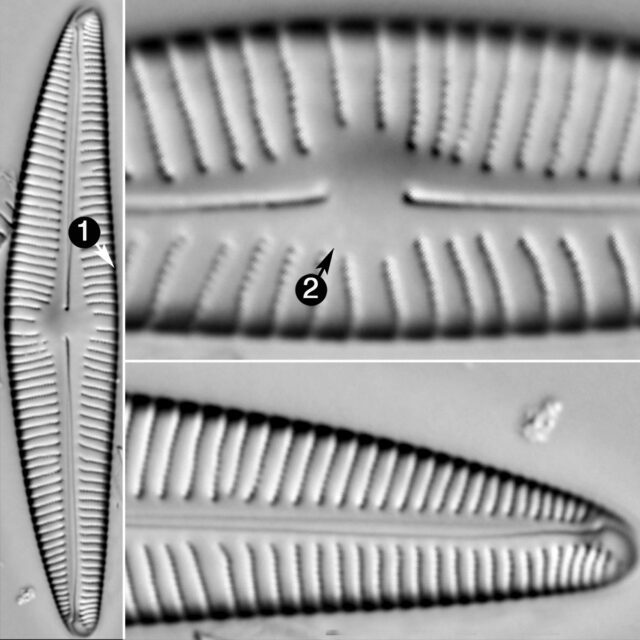 The striae are slightly radiate across most of the valve, except at the apices where they are slightly convergent. Internally, the proximal raphe ends are strongly deflected dorsally. The ventral margin is usually moderately tumid in the center valve, while the ventral margin in the smallest specimens is convex. The central area varies within populations, from round to indistinct.